A candlelit dinner with soft music, just the two of you… you want to be at the table, enjoying your significant other’s loving gaze, not sweating in the kitchen. I hear you. I’m the same way. When you have a quick dish in which the flavors meld into each other in a pleasing way, it only adds to the ambience of the evening. When you find a wine that compliments everything to the point that those candle flames glow a little brighter – well, you know you’ve got a winner. I poured a Sangiovese from Montoliva Vineyard and Winery to go with dinner, the 2008 Estate Reserve Sangiovese to be exact. It accentuated the peppery flavors of the arugula and was perfect with the steak and parmesan and was even a good compliment for the second green thing on the plate – roasted broccoli with Cypress Grove’s Purple Haze chevre. The pairing ended up being a smack-your-lips delicious combination and would be a lovely addition to any Valentine’s Day plans. Plus, the meal is light enough, it will leave you room for a dessert of your choice. Preheat griddle over high heat. Pat salt and pepper into both sides of the steak. Drizzle a little olive oil onto the griddle and place steak onto the griddle. Cook for about two minutes. Flip steak over, turn down heat, and cover with a lid, cooking for another four to six minutes, until an indentation left by a finger slowly bounces back. (Medium rare.) Take off heat and let rest for a couple of minutes. While steak is cooking, scatter broccoli on a cookie sheet. Drizzle with olive oil and put under the broiler until florets begin to brown. Scatter with the chevre, crumbling it as you go. Return to the broiler for a couple more minutes, until the cheese begins to brown. Scatter arugula on two plates and drizzle with olive oil and balsamic vinegar. Grind some black pepper on top. 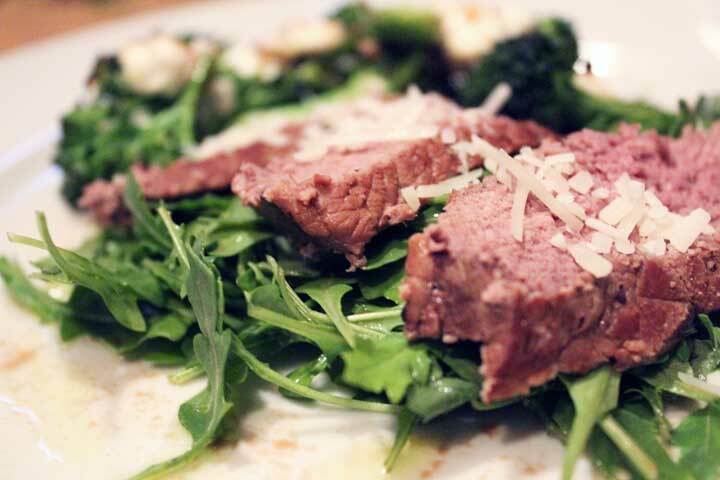 Slice steak into thin strips and lay on top of the greens. Scatter Parmesan on top. Side with the roasted broccoli/chevre combination and serve right away.